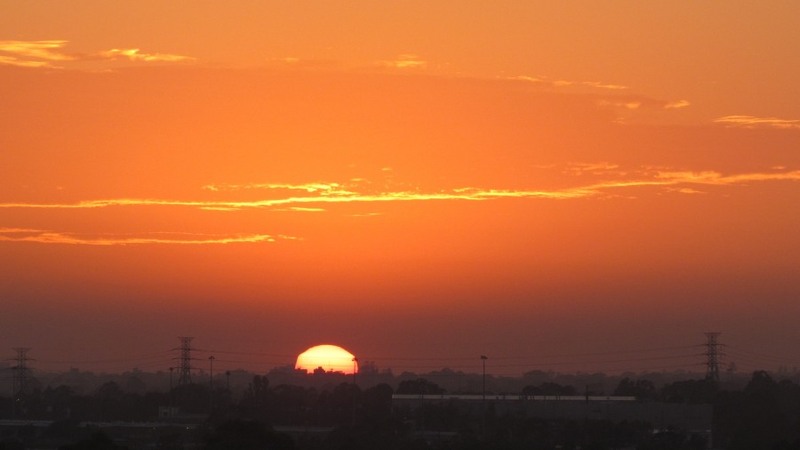 There are indications today that heat records will be approached in western Sydney. Speaking to David a moment earlier, access models are pointing to temperatures of up to 46C today. At just past 11am, it was 41C and obviously climbing. Just checked temperatures and it is already nearing 43C at just before midday! This is the type of day that will produce extreme heat! 45.8 @ 2:55pm at Obs Hill, all time record, ouch. 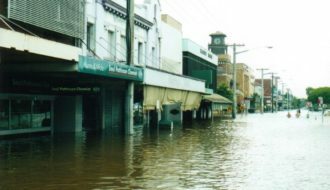 Other sites that topped 46 are Penrith, the winner with 46.5, followed by Richmond, Camden, Airport (all 46.4) and Bankstown (46.1). Might not be over yet for some sites away from the coast. 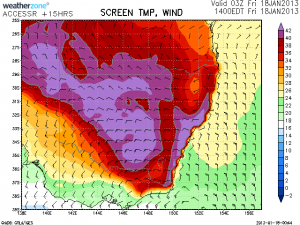 Bring on the southerly! I want 50, is it possible? I can cook an egg outside, I am sure it will cook instantly lol.. Anyway, we are enjoying swimming here at the pool! You beat me to it – I guess I was half guessing records would tumble today but wow! That Sydney observatory hill record is significant given it stood since January 1939. Oh and by the way although it is cooler here at the local pools, you can still feel the heat from the roof and wind coming in from the opened doors. This morning 18/1/2013, I successfully shot a sequence of photos showing the sunrise over Sydney from the roof of the Auburn City Council carpark pushing my camera to its limit. If the sun was any brighter, I could not have done this. The sequence was taken between 6 am and 6.09 am. Smoke from bushfires burning across NSW filled the sky creating this terrifying but ominous glow. I never expected Sydney Observatory Hill to breach that 45.3C record set on 13 or 14 January 1939. 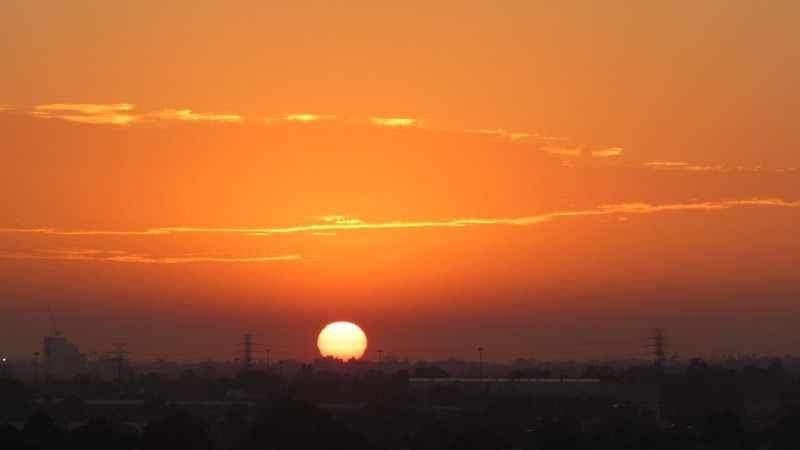 This marked a special day for a record maximum temperature for Sydney. Third photo is provided. Much of Sydney sweltered as temperatures reached well into the 40s. The glow of the dawn as shown heralded the days heat. With no cloud cover, temperatures climbed quickly. Cloud started to build during the later part of the afternoon, but by that stage the maximum temperatures for the day had already been reached. 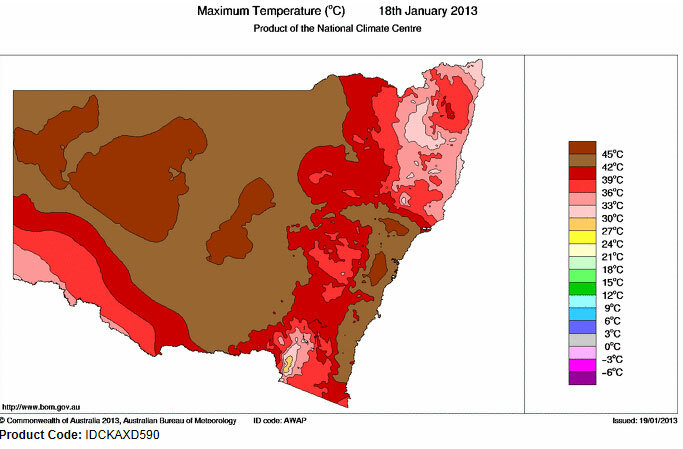 Harley Pearman, I will let you summarise the latest on this significant heat event for Sydney. This event was not too dissiimilar to the event in 2001 when clouds rolled in during the afternoon and evening hours. One difference was that the heat in 2001 did not rapidly increase until the afternoon period when dew points dropped from near 20C to single figures if I recall correctly. Funny that you mention this Imelda. ON the way to dropping Kimberly off to work this morning I noticed once again something different on the road. There were patches of pot holes but they were not true pot holes. What I realised that happened was that the extreme heat yesterday would have melted the pothole mix they put in the potholes. The true pothole tar was still intact in other parts of the road! 45.8C at Observatory Hill at 2.55 pm. 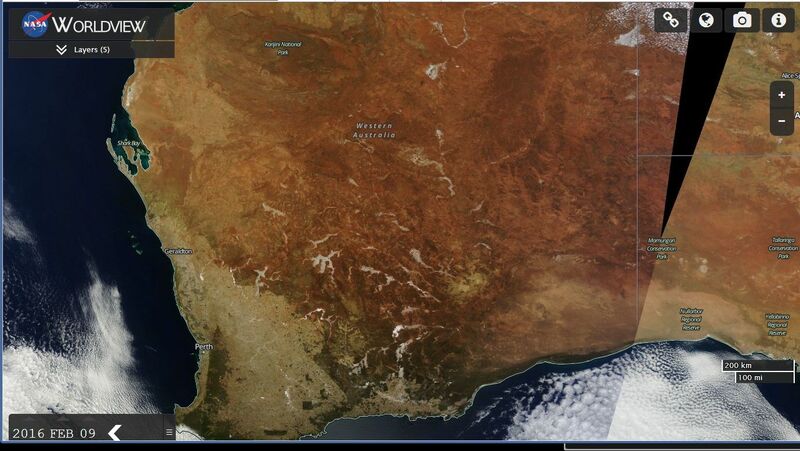 This beat the 14 January 1939 peak record of 45.3C. Its taken 74 years to break this one. This was short lived because once the cloud started to build, the temperature did start to drop. Bankstown – 46.1C at 3.28 pm. Camden – 46.4C at 3.04 pm. 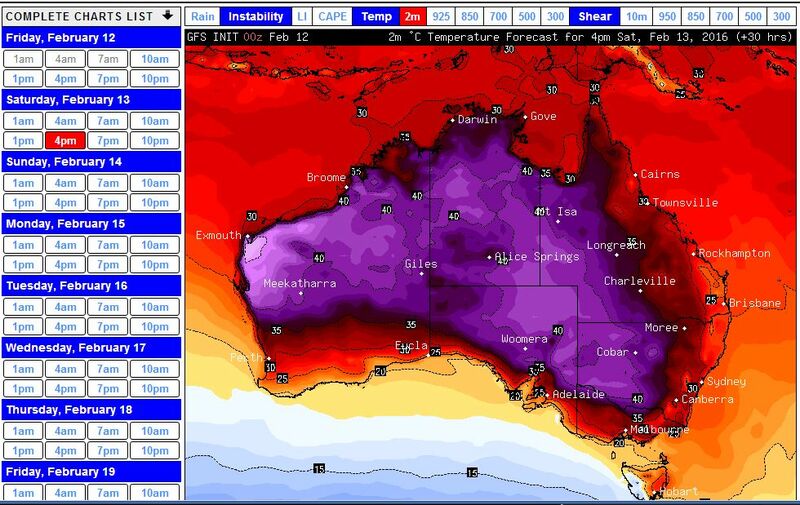 Penrith – 46.5C at 2.16 pm. (This has exceeded that 46C set on 15 January 2001). Prospect – 45.1C at the reservoir. A weather station near Bradleys Head in Sydney Harbour recorded 29C due to the sea breeze. The NW winds were able to keep the sea breeze at bay to allow these temperatures to occur so close to the coast. The actal peaks were shortlived because cloud started to build by 3 pm and I even experienced a brief rain shower at Auburn at 3.55 pm. One should not forget that the heat was repeated along the New South Wales Coast as well. It even reached 45.2C at Nowra, 45C at Kiama, 44.8C at Gosford, 44.6C at Bega, 44.5C at Ulladulla, Such high temperature peaks are unusual at some of these locations. 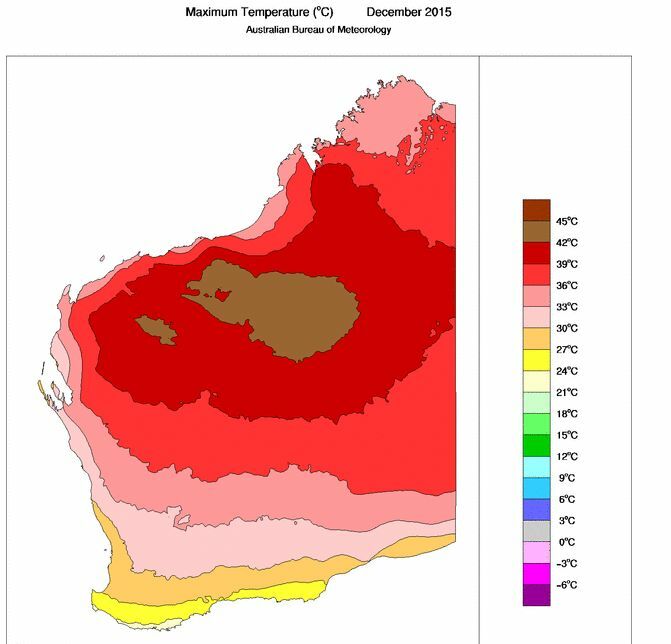 Many of the maximum temperatures were slightly hotter than Bourke and Ivanhoe which had 43C respectively. 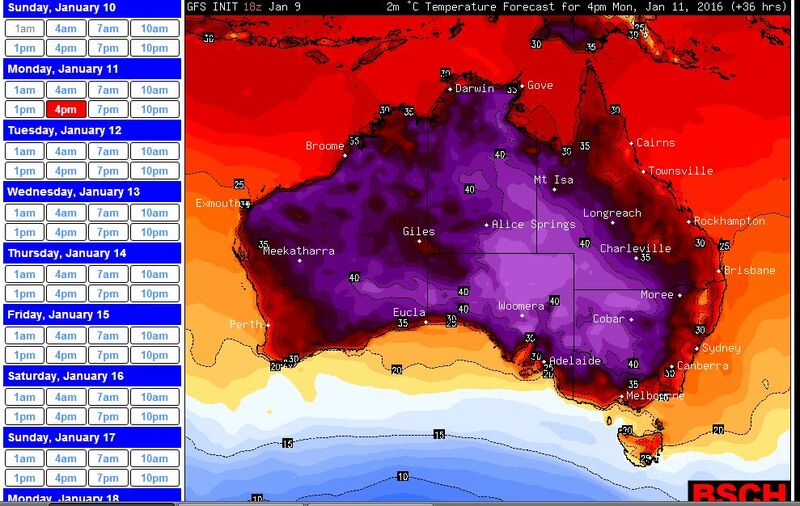 Newcastle had 44.8C which beat the previous record of 44.7. A southerly change brought a rapid end to the high temperatures after 3 pm along the New South Wales South Coast. That change reached Blacktown by 7.54 pm bringing some significant winds and a noticeable drop in temperatures but no rain. 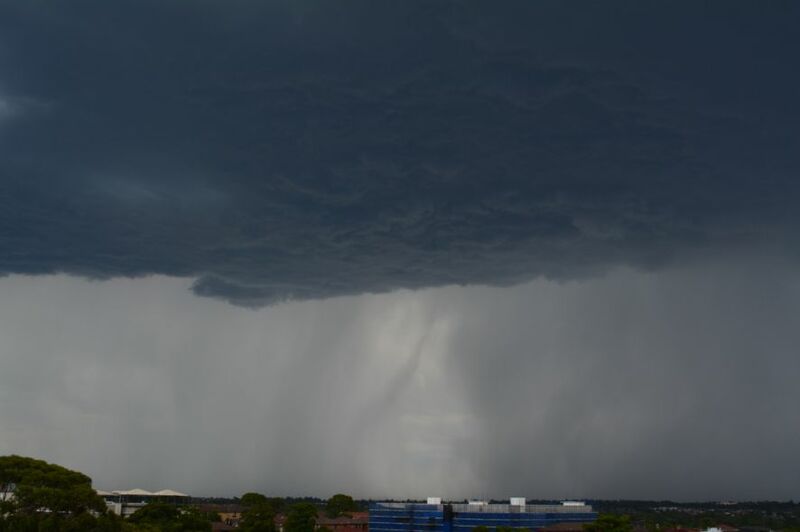 There is a report in the papers of a brief thunderstorm around Terrey Hills around 5.30 pm bringing light rain but wind gusts of up to 103 km. Today, I drove out to Bathurst to look at how the Australian bush has weathered this heat and dry spell. While it has been been dry here in Sydney, areas west of Lithgow are extremely dry, bordering on parched and any fire will readily take hold. It is very dry and grass and leaf litter and debris has certainly built up on the ground creating a serious fire hazard. There has been one bush fire just south of Lithgow which has left a noticeable scar on a hill south of town. Smoke haze from distant fires is visible across the sky especially to the north west. I noted more road kill than usual along the Great Western Highway. 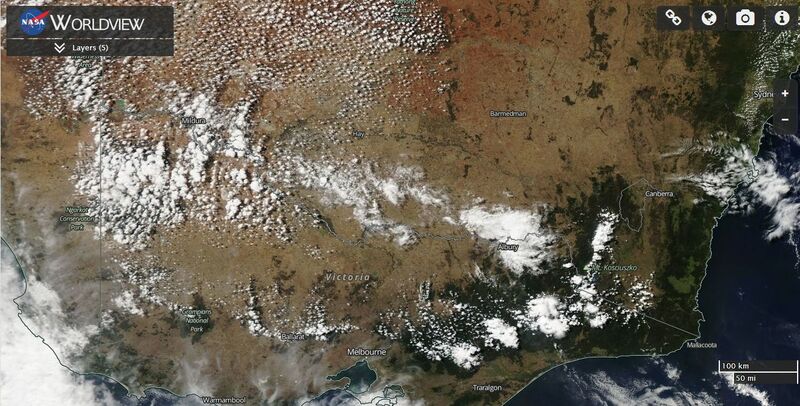 Very light patchy rain around Bathurst was having little impact on the ground. The soil was absorbing whatever rainfall had fallen. However slightly heavier rain just to the north and east of Bathurst would have been welcome by those affected by it given the current circumstances and weather extremes just experienced. While I was at Bathurst, todays peak temperature was a pleasant 25C compared to 39C recorded there yesterday. That is significant because the city is over 600 metres above sea level. 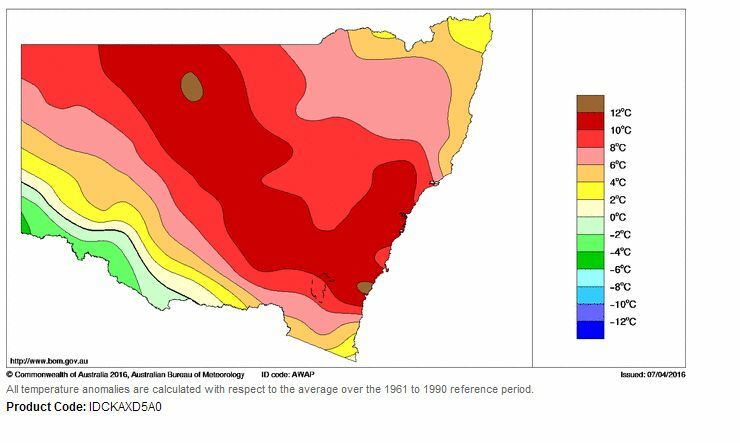 The highest temperatures across NSW for 18/1/2013 were recorded along the coast from the Hunter Valley right down to the New South Wales South Coast towards the Victorian state border. Much of the inland also sweltered. 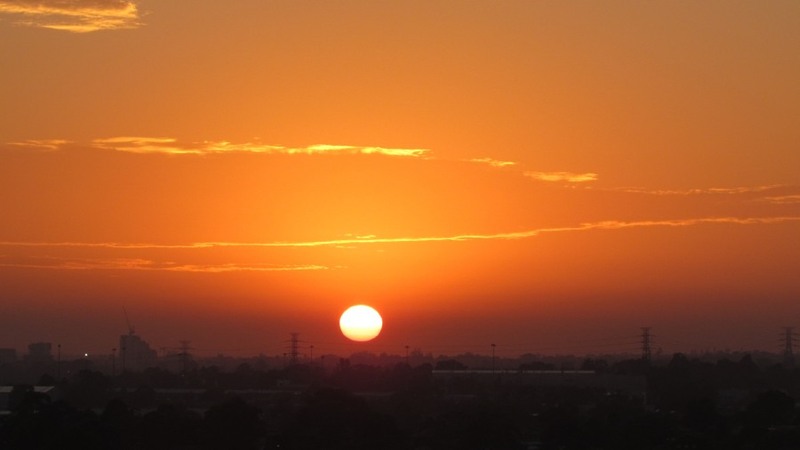 Only the far south west of New South close to the Murray River, the higher reaches of the Great Dividing Range and north east New South Wales escaped the worst of the heat. The coolest locations were those around Mt Kosciusko and the higher regions of the Northern Tablelands.